Dave lives in Oswestry with his wife Jane. He was diagnosed with prostate cancer in 2011. “I got the results over the phone while we were on a walking holiday in the Lake District. A specialist nurse talked me through it, but I was in shock, thinking ‘this poor woman has had to tell me I have cancer over the phone. When I was diagnosed with prostate cancer, I felt perfectly fit and healthy. I was playing cricket, mountain walking and running regularly. My wife Jane has recently been for a check-up at the Well Woman clinic, and being a modern minded sort of bloke, I thought I would do the same, and booked myself in to the Well Man Clinic. At the time, i didn’t feel it was necessary. I was given a prostate examination, and the doctor began to look worried, his brow knitted. He referred me to a specialist and the details then become a bit of a blur. I had an appointment at the Princess Royal Hospital, where I had a prostate needle biopsy – a very uncomfortable procedure where 12 samples were taken via needle to check for malignant tissue. I got the results over the phone while we were on a walking holiday in the Lake District. A specialist nurse talked me through it, but I was in shock, thinking ‘this poor woman has had to tell me I have cancer over the phone’. I felt completely stunned. When I was a youngster, everyone who had cancer, ‘The Big C’, well, that was it for them. My attitude and knowledge hadn’t been updated at the time, and I didn’t know how to react. I didn’t realise how much treatment had advanced. I wanted to read everything. A GP friend described me as ‘a very cerebral kind of bloke’ and I think that’s true – I wanted to understand everything about what was happening to me. I was surprised to find that a lot of people weren’t like that – many of the other patients I met were really quite passive. I didn’t question the judgement of my doctors, but I wanted answers. The staff always answered my questions, and were deeply sympathetic, understanding and compassionate. I had a PSA test [a blood test that measures levels of prostate specific antigen – high levels of PSA can indicate prostate cancer, amongst other issues]. My PSA level was not suspiciously high. My Gleason Score [a measure of the density and incidence of cancer cells] wasn’t unusually high either. As these were both within a certain range I was expecting to be told they would put me on ‘active surveillance’, so it was a huge shock when the specialist told me he was recommending I had surgery. I instinctively didn’t want a part of my body removed. I had two options – surgery or radiotherapy. I thought Jane would want me to have the surgery but she was fully supportive of my decision. So, I refused the surgery option and went into active surveillance for a while. Another biopsy came back showing no signs of cancer – so I nursed the hope I had cured myself for a while, but in reality, I assume the needle had just hit healthy tissue this time. An MRI scan then showed that the cancer has started to spread. Surgery was no longer an option and radiotherapy began. Prostate cancer is unusual, as in a lot of cases it is not possible to tell if it will spread or cause any serious problems. The statistics show that prostate cancer is incredibly common in older men, and, as they say, “more people die with it than of it”. It puts the staff in a really difficult position – they are giving you advice about your treatment when actually there is a chance that the treatment will affect you more than the cancer itself. My treatment may still have been unnecessary but perhaps I’ll never know. Once I’d decided to go ahead with radiotherapy, I stopped worrying and felt a lot more positive. I had 37 treatments – one every day (except weekends) for over seven weeks. Radiotherapy is painless – I heard people complaining about travelling every day to their appointments and I just thought ‘They really should think about what is being done for them here’. I arranged appointments early in the morning and went off walking in the Shropshire hills every afternoon. I was really worried that the radiotherapy would make me feel tired and unable to exercise, but this wasn’t the case for me – which was great, as I had already planned to do the Welsh 3000ers challenge [a walk covering all 15 of the Welsh mountains over 3000ft] that summer and I needed to stay fit! Following radiotherapy, I had hormone treatment for two years. The treatment suppresses the production of androgens (male hormones), which stimulate the growth of prostate cancer cells. Side-effects of this include a loss of muscle mass and strength. I found the impact on my fitness and athletic performance frustrating. 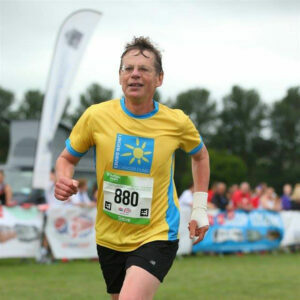 The year before my treatment, I ran a half marathon in 1 hour 46 minutes, but after radiotherapy and hormone treatment my race time was 2 hours 32 minutes. I am now back to much better running form, having trained for the London Marathon this year! During the second year of hormone treatment, I started to feel depressed. It was as if my brain had been taken over by someone else – my reactions didn’t seem to be my own. I had thoughts I wouldn’t normally have had. I would be tearful for no reason, and one day I wondered ‘is life like this worth living?’ and I knew I needed to do something about how I was feeling. On New Year’s Eve 2015 I started what would be a 12 month course of anti-depressants which helped enormously. It’s funny how I was reluctant to take them and yet they really did make me feel myself again. I stopped taking them at the end of 2016 and I now feel fine without them. I still feel occasionally low and I do wonder if that is a result of the hormones, but I really just need to remind myself that everyone has low days sometimes – including me, before any of this happened. What also helped me when I was feeling low? An occasional glass of wine or beer, and the support of my wife Jane – she loves helping other people and is profoundly sympathetic. She was wonderful. Initially, I wanted to come to terms with it all in my own time. I didn’t tell many people and I never told my mother – she was a worrier and it wouldn’t have helped me or her. Looking back, I think it would have done me good to have talked to more people sooner particularly as I was in a position of working for myself, at home, and at the time was quite socially isolated. This has been one of the biggest changes since my treatment. I began talking to people during my radiotherapy – you see the same people every day and do get to know them. I am now able to talk about my experiences in a very matter of fact way – it’s liberating. 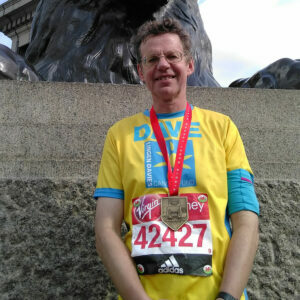 I speak to a lot of people about my cancer and about Lingen Davies, as well as being heavily involved in fundraising activities. I used to be wary of the reactions of others but now I will just mention it in passing and it doesn’t seem so difficult. I still relish time alone but I have also discovered café culture! I will now regularly meet friends for a coffee and a chat – not meeting other people before meant that my views were not challenged and I may have become the stereotypical grumpy old man! I have also joined Oswestry Writers Group, taking my previously solitary pastime into a social space. All these things feel very positive to me. The social side of things has been good for me and was a completely unforeseen result of having prostate cancer. I never felt ill, either because of the cancer or treatment. Radiotherapy does leave some lasting legacy and I wouldn‘t say I am completely unaffected by it, but on the whole I feel fine now.